Zelie Guerin Martin (1831 – 1877), also born into a military family whose father served in the police force and later retired at Alencon, had longed to be a religious sister of the Daughters of Charity. She studied under the Sisters of Perpetual Adoration, where she learned the delicate skill of lacemaking. Before their marriage in 1858, Zelie had already established a successful lacemaking business, operated from her home. Within three months of their providential meeting, Louis and Zelie were married at midnight, July 13th, at the cathedral of the Assumption in Alencon. The couple saw their marriage as a work of God, deciding that God would always be “the first served” in their home. From the beginning, they decided to try to maintain perfect chastity, adopting an eleven-year-old child of a distressed widower as an act of charity and parenthood. Upon the advice of a priest-friend, after ten months the happily married couple decided to have as many children as possible to offer to the Lord. They were blessed with nine children, all given the first name of Marie. But only five survived to adult life. These five young women all entered religious life, for which their mother Zelie had prayed fervently. Family life at the Martin household was joyful and pious. The family prayed together each day, with daily Mass and a reading from the daily liturgy of the hours. Among the saints familiar to the family were St. Louis de Montfort, St. Francis de Sales and St. Vincent de Paul. In the city of Paris, in 1830, a young member of the congregation of the Daughters of Charity, founded by St. Vincent de Paul, named Catherine Laboure had received a vision of the Blessed Virgin Mary, asking her to promote the use of what is now known as the Miraculous Medal, with the words, “Mary, conceived without sin, pray for us who have recourse to Thee.” The devotion was approved and spread rapidly throughout France, although the dogma of the Immaculate Conception had not yet been proclaimed. On the other side of France, in the southern town of Lourdes, in 1858 a young peasant girl named Bernadette Soubirous reported the apparition of “a beautiful lady” who identified herself as “the Immaculate Conception,” confirming the recent dogmatic proclamation of Pope Pius IX. Surely these events influenced the spirituality of the Martin family. One by one, Louis’ daughters left the family circle to enter convents. First Pauline entered the Carmel of Lisieux, and later Marie. This left three girls, Leonie, Celine and Therese, at home. Asking for her father’s permission to enter the Carmel of Lisieux at the age of fifteen must have been one of the most painful sacrifices of Therese’s life. Not long after she had entered, her father confided to his three daughters in Carmel that he had visited the church where he had married their mother. “My God, I am too happy. It’s not possible to go to Heaven like that. I want to suffer something for you.” He offered himself then to God. This was in May of 1888. Less than ten years later, his youngest daughter would offer herself as a Victim of Merciful Love. In 1889, after suffering two paralyzing strokes, Louis Martin was committed to the care of the Good Savior hospital in Caen, a decision that was enforced by his devoted brother-in-law Isidore Guerin, who became legal guardian of the family. In 1892, returning to the home in Lisieux paralyzed and unable to speak, Louis was cared for devotedly by his daughters Leonie and Celine until his death in 1894. Soon both Leonie and Celine had entered convents. 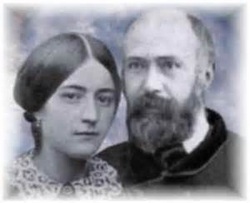 The deepest desire of Louis and Zelie Martin had been fulfilled: all of their children on earth had been consecrated to God. BREAKING NEWS: Bishop Jean-Claude Boulanger of the diocese of Lisieux announced his intention of officially opening the CAUSE FOR THE BEATIFICATION OF LEONIE MARTIN, third child of Louis and Zelie Martin and SISTER OF ST. THERESE. Leonie Martin (Sister Francoise-Therese) June 3, 1863 to June 16, 1941, was a Visitandine Nun at the convent of Caen, France, for most of her life. Miracles have been reported to have occurred at her gravesite. Leonie was known as “the difficult child” of the family. She attempted to join the Poor Clares three times before finally discovering her true vocation with the Visitation Nuns, founded by Saint Francis de Sales and Saint Jane Frances Chantal in 1610. It was Therese’s “Little Way of Spiritual Childhood,” of which Leonie was a devoted disciple, which opened up for her a path of spiritual growth.